Download "ABOUT LOUGHBOROUGH UNIVERSITY PLANNING OFFICE (VICE-CHANCELLOR S OFFICE) PLANNING OFFICER FIXED TERM FOR 2 YEARS JOB REF: REQ15117 FEBRUARY 2015"
2 The system of short-term contracts has particularly negative consequences for the retention and progression of women in science, which the organisation recognises There are both personal and structural obstacles to women making the transition from PhD into a sustainable academic career in science, which require the active consideration of the organisation The University holds a bronze institutional award and departmental awards in Sports, Exercise and Health Sciences (silver) and Design (bronze). We have action plans associated with these awards and a programme in place that will see all STEM Schools submit for awards over the next 2 years. In addition, we are considering the possibility of adopting Athena SWAN data monitoring principles in non-stem schools and more widely across the University. Indeed, the Athena SWAN charter will expand in 205 to include arts, humanities, social science, business and law departments alongside the current STEM disciplines. The planning officer plays vital roles in: The preparation of institutional submissions and the delivery of the associated action plan Support to Schools (planning, surveys / interviews / data acquisition, submission writing), alongside the school leads, for School submissions Obtaining and analysing staff and student data for the above. Looking for ways to streamline the above Based in the Planning Office and reporting to the Director of Planning, you will also work closely with the Staff Development Adviser (Equality and Diversity), Ms Abida Akram, and the Chair of the institutional Athena SWAN self-assessment team, Prof Steve Rothberg. 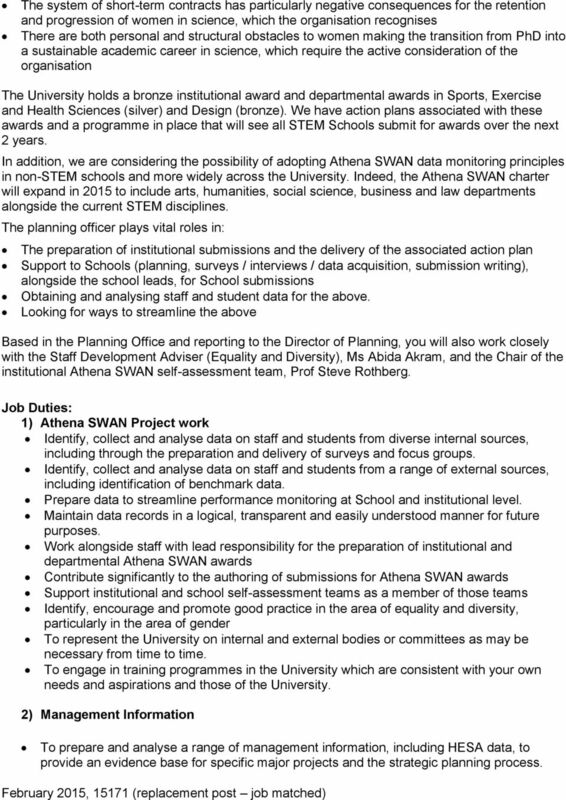 Job Duties: ) Athena SWAN Project work Identify, collect and analyse data on staff and students from diverse internal sources, including through the preparation and delivery of surveys and focus groups. Identify, collect and analyse data on staff and students from a range of external sources, including identification of benchmark data. Prepare data to streamline performance monitoring at School and institutional level. Maintain data records in a logical, transparent and easily understood manner for future purposes. Work alongside staff with lead responsibility for the preparation of institutional and departmental Athena SWAN awards Contribute significantly to the authoring of submissions for Athena SWAN awards Support institutional and school self-assessment teams as a member of those teams Identify, encourage and promote good practice in the area of equality and diversity, particularly in the area of gender To represent the University on internal and external bodies or committees as may be necessary from time to time. To engage in training programmes in the University which are consistent with your own needs and aspirations and those of the University. 2) Management Information To prepare and analyse a range of management information, including HESA data, to provide an evidence base for specific major projects and the strategic planning process. 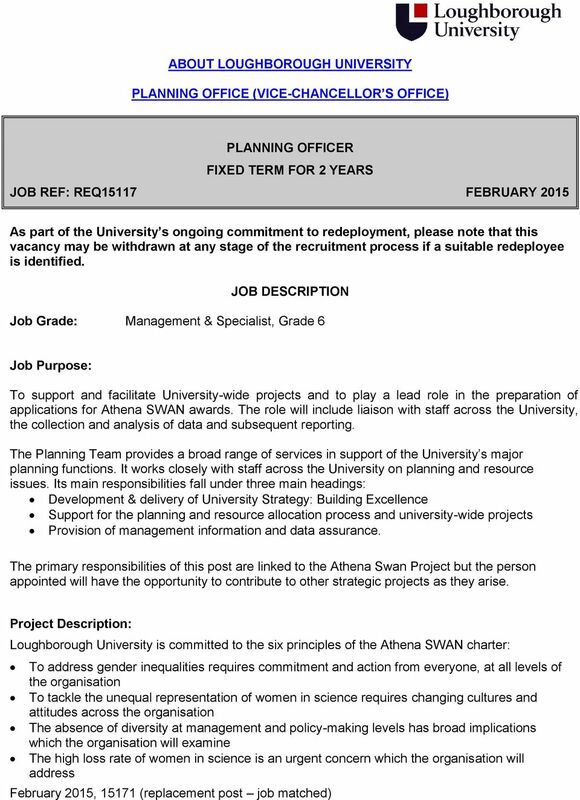 4 PLANNING OFFICE (VICE-CHANCELLOR S OFFICE) PERSON SPECIFICATION Job Title: Planning Officer Job Grade: Management & Specialist, Grade 6 Experience Essential Desirable Stage to be Assessed collecting and delivering an analysing Higher Athena SWAN Education data submission. 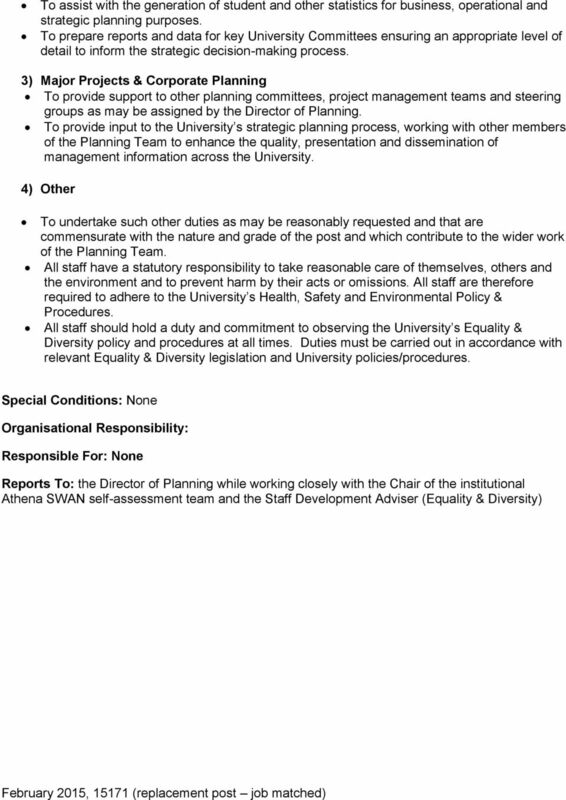 and other management information at a scale appropriate to the University. delivering reports of the standard necessary to secure a prestigious national award. working with senior managers. providing professional support for Committees or Governance processes, including committee servicing. Significant experience of data analysis and manipulation, including familiarity with large databases working in or with Higher Education and of working in a STEM discipline. 7 Stages in Assessment: = Application Form, 2= Selection Test i.e. 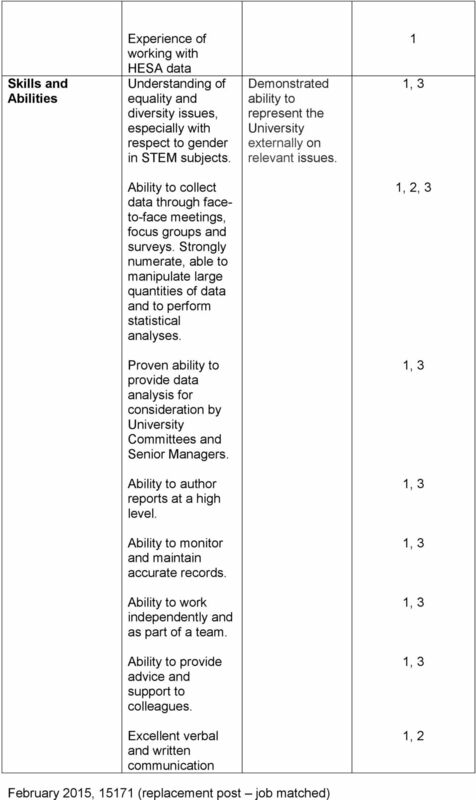 presentation, in-tray exercise, data analysis 3= Interview Conditions of Service The appointment will be on a full-time, fixed-term contract for 2 years. Salary will be on Management and Specialist Grade 6, 28,695 to 37,394 per annum, at a starting salary commensurate with experience and qualifications. 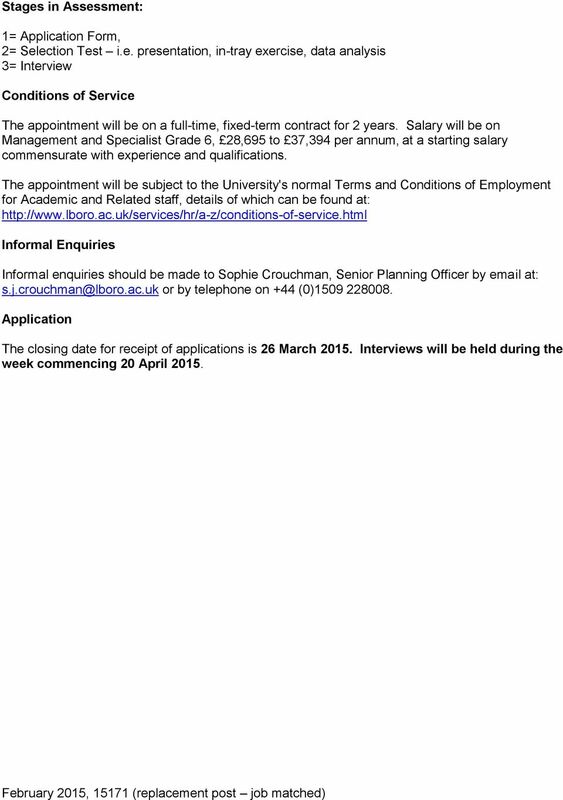 The appointment will be subject to the University's normal Terms and Conditions of Employment for Academic and Related staff, details of which can be found at: Informal Enquiries Informal enquiries should be made to Sophie Crouchman, Senior Planning Officer by at: or by telephone on +44 (0) Application The closing date for receipt of applications is 26 March 205. Interviews will be held during the week commencing 20 April 205. JOB DESCRIPTION. Support Registry Services Department: Contribute to the wider function of the Registry Services Department as and when necessary. As part of our VC2020 Lectureship programme, we are looking for an outstanding new Lecturer in Information Systems. To provide an efficient and effective HR and Payroll service to support the work of the HR department. Provide support and cover for other Lead Administrators, as well as support and cover for other members of the team. 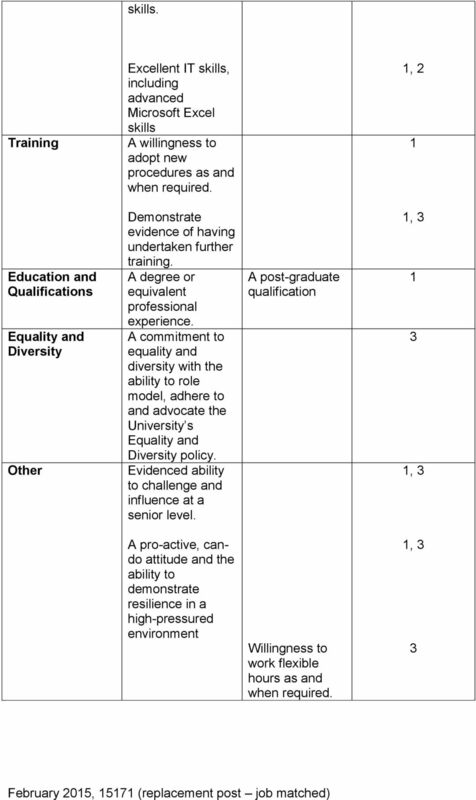 POSITION DESCRIPTION Student Liaison Officer LincolnConnect Vacancy 15-41 May 2015 POSITION DESCRIPTION Student Liaison Officer Context Lincoln University is New Zealand s specialist land-based university. We have introduced the title of Associate Professor for our grade 9 academic staff, which is equivalent to Senior Lecturer. ATHENA PROJECT Case Study No 9 UNIVERSITY OF OXFORD SWAN BRONZE AWARD MARCH 2006 The University of Oxford, a founder member of the Athena SWAN Charter, was awarded Bronze SWAN recognition in March 2006. A job description and further details including organisation charts are attached. Establishing and maintaining the highest standards of Financial Management across the University. To ensure that outstanding Teaching, Learning & Assessment are at the heart of all the College does.